The forty-year love affair between Rachel and Andrew Jackson parallels a tumultuous period in American history. Andrew Jackson was at the forefront of the American revolution―but he never could have made it without the support of his wife. Beautiful, charismatic, and generous, Rachel Jackson had the courage to go against the mores of her times in the name of love. As the wife of a great general in wartime, she often found herself running their plantation alone and, a true heroine, she took in and raised children orphaned by the war. Like many great love stories, this one ends tragically when Rachel dies only a few weeks after Andrew is elected president. He moved into the White House alone and never remarried. Andrew and Rachel Jackson’s devotion to one another is inspiring, and here, in Patricia Brady’s vivid prose, their story of love and loss comes to life for the first time. 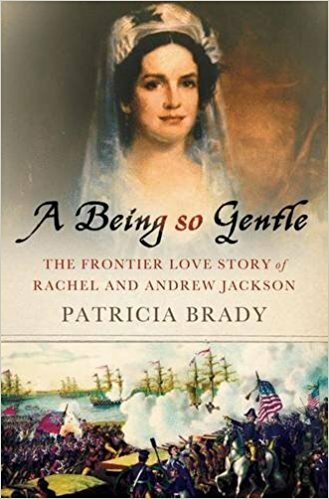 A Being So Gentle is the love story of Rachel and Andrew Jackson. I enjoy reading non-fiction books about people and places that I don’t know a lot about. This book covered the life of a president and his wife that I didn’t know a lot about, but was interested in. I found the story fascinating. They lived in a time that was so different than today, yet so similar at the same time. Much of their life and story proves that politics really haven’t changed that much. The modern media and social media has changed some things about politics, but the people and the workings of politics are still the same. It is messy and full of messy real life people. They have stories and backgrounds and lives before they are president. This was just as true 150 years ago as it is now. This book was a great reminder of that.